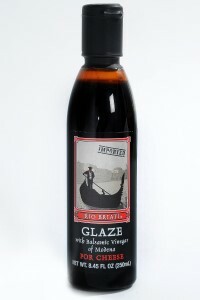 This Balsamic Glaze or Balsamic Cream is a balsamic reduction, creating a rich and thick, syrupy cream, creating a faster and easier solution. This Italian cream, syrup like reduction is perfect for adding a tart contract to your desserts, and it a great addition to savory dishes. Add a few drops on your Italian gourmet cheeses; it is enough to give you that distinctive Balsamic flavor to any number of dishes. Ingredients:cooked grape must, balsamic vinegar of Modena 45% (wine vinegar, concentrated grape must), modified maize starch. Contains sulfites.